I love these bottle stoppers ($38), which are handcrafted from actual vintage door knobs. Each one is unique: the chipped paint, dents and flaws are part of their appeal. These make great gifts for wine lovers and cooks, and the hardwood-reinforced cork promises that they’re built to last. How cool are these? 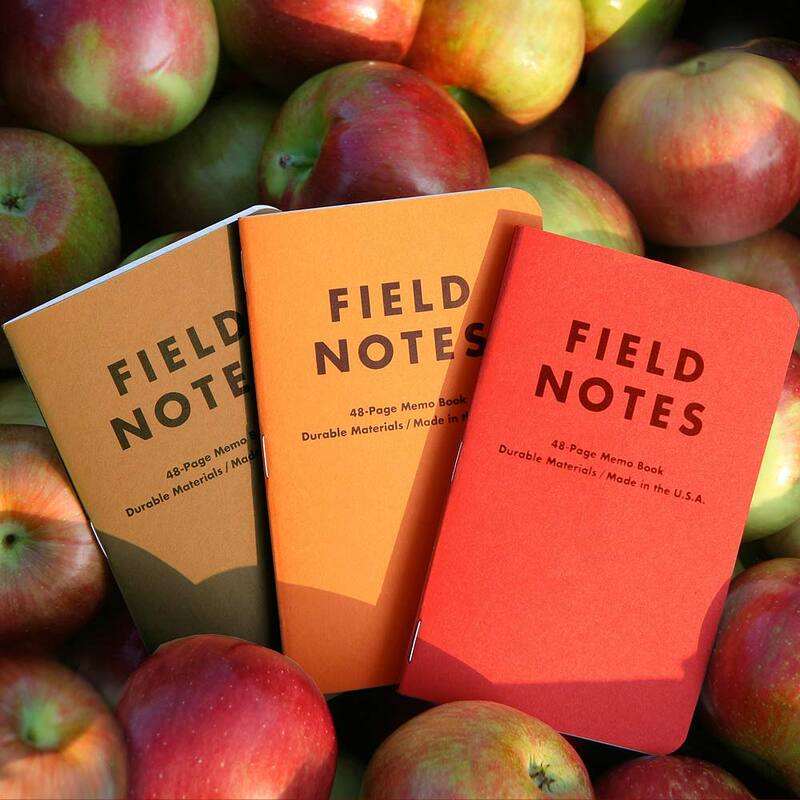 Our pocket-sized Field Notes books come as a three-pack ($12), and each is saddle-stitched with 48 pages. Inspired by vintage agricultural books and pocket ledgers, they’re printed and manufactured in the United States. I love the company’s slogan: “I’m not writing it down to remember it later; I’m writing it down to remember it now.” No wonder they have such a cult following. To see more, click here for a fun video. Sometimes it pays to talk to total strangers: Granola Barks dog treats are now at the store. This past weekend was the annual Junior League of Nashville fundraiser, ‘Tis the Season Holiday Marketplace, at The Factory in Franklin, TN. It was the first time our store had participated in a show of any kind, and it was busy, exhausting and fun. We had an excellent booth location, and the Junior League volunteers took great care of us. On Saturday morning, I was having a quick, pre-show breakfast in the merchant lounge area, and these two nice guys, Mike Quaranta and Marston Maddox, sat across from me at the table. This is what I found out about their venture: Two Good Dogs is an all-natural dog treat company based in Nashville, TN. Founded in the Spring of 2009, it’s named in honor of Mike’s two dogs, Rocco and Chico. When the pups began having health issues and required a diet change, Mike began researching canine nutrition and experimenting with meal and treat recipes. In the process, he developed Granola Barks. 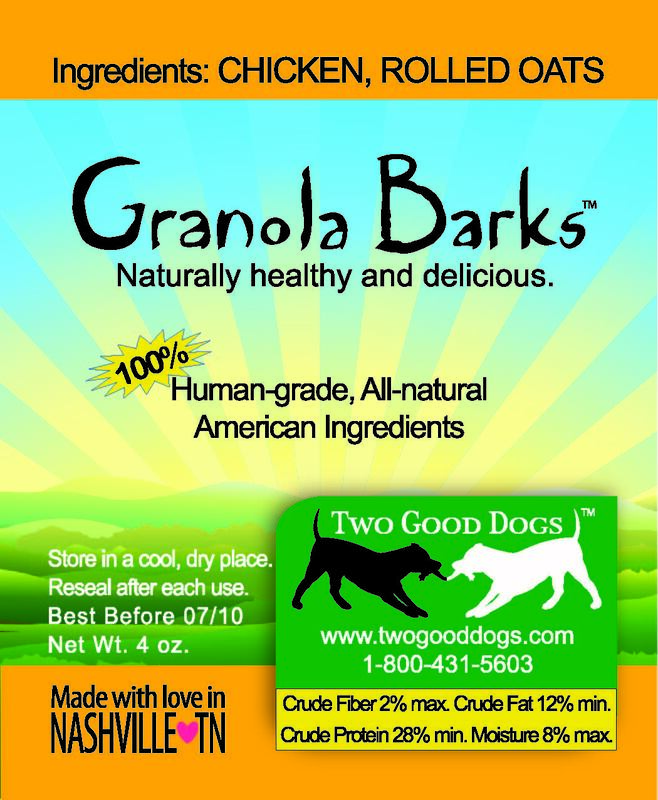 Granola Barks are handmade with all natural, human-grade white meat chicken and old-fashioned rolled oats. There are no other ingredients. They’re blended, then baked into crunchy, bite-sized treats that are naturally healthy and delicious for dogs. I bought a case on the spot, and we now sell them at the store for $5/bag. We’re pleased to welcome jeweler Kelly Joseph, founder of Kelly Joseph Designs, to the store. If you’ve been to Seaside, FL, in recent years, you’ll recognize Kelly Joseph’s exquisite leather and pearl jewelry designs. We’re pleased to offer her work at the store, and I hope you’ll keep them in mind for holiday gifts this year. Prices range from $60 to $650, and they’re appropriate for all age groups. These versatile pieces are fashioned from freshwater and “black” Tahitian pearls. They can go with casual outfits, such as jeans, and also do well with business suits and cocktail attire. I had the pleasure of meeting Kelly and her fiance, Tommy Crow, a few weekends ago at the Artcletic fundraising event at USN. Once we agreed to work together, they installed a fabulous display of her jewelry in a large pine cabinet at the store, which I purchased at a flea market in France many years ago. Utilizing old driftwood, black sand, large clam shells and weathered linen, the display is as beautiful as the jewelry itself. Note: all photos used in this post are courtesy of Tommy Crow Studios, www.tommycrow.com. Anxiously awaiting our shipment from Olive & Sinclair Chocolate Company! “So what is Southern Artisan Chocolate? Hand-crafted by native Nashvillians in the heart of Music City, Olive & Sinclair is proud to be the original ‘bean-to-bar’ chocolate maker of the south. Slow roasted and stone ground in small batches, select single origin beans are combined with pure brown sugar for a smooth and robust flavor that’s unique to Southern Artisan Chocolate. Our combination of traditional methods, modern European technique, and classic southern flavors make Olive & Sinclair the new, old-fashioned chocolate.” Yum!